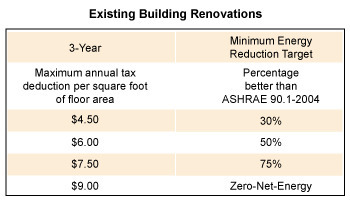 The U.S. Department of Energy and its National Renewable Energy Laboratory (NREL) has recently added large office buildings and large hospitals to its inventory of technical reports that provide recommendations on how to achieve a 50% energy savings as compared to ASHRAE Standard 90.1-2004 (prior reports include General Merchandise, Grocery Store, Lodging and Medium Offices). This reduction below code will achieve buildings that meet the current 60% reduction target called for by the 2030 Challenge. View the first Technical Support Document, Strategies for 50% Energy Savings in Large Office Buildings (pdf), the second Technical Support Document: Large Hospital 50% Energy Savings (pdf) and NREL’s prior reports listed above available on www.nrel.gov. For more information, visit the Building Technologies Program web site.